 On Saturday April 27, Eastern Shore Rabbit Rescue and Education Center (ESRREC) will hold its third annual “Bunny Hop-a-Thon” at the Rock Hall American Legion. 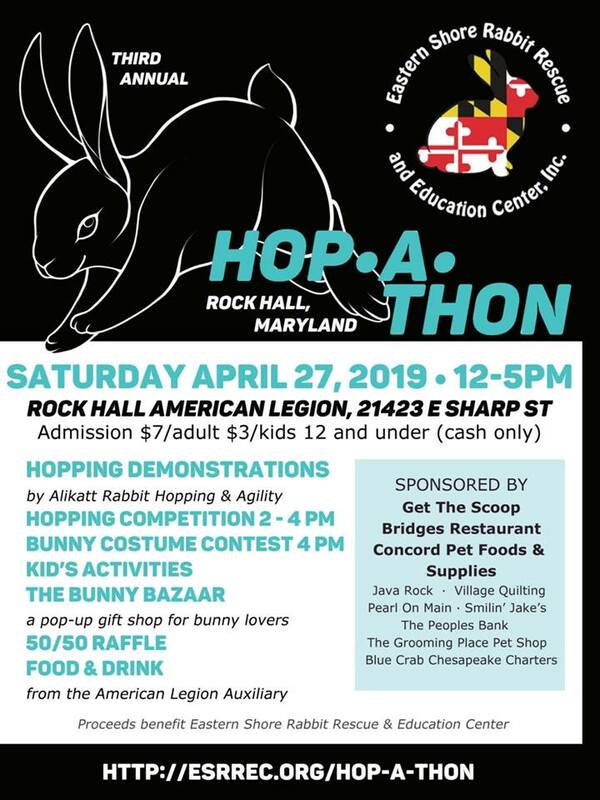 Showcasing the European spectator sport of rabbit jumping, the Hop-a-Thon will be open to the public from 12-5pm, with admission fee of $7 for adults and $3 for children (12 and under). A dozen rabbit owners are registered to take a “beginner’s hopping class” in the morning with Alikatt Rabbit Hopping and Agility, a Pennsylvania-based instructor, who will also provide hopping demonstrations in the afternoon. A competition will be held from 2-4pm with multiple levels of difficulty. During the event, ESRREC will also offer children’s activities and a “Bunny Bazaar” (pop-up gift shop for bunnies and bunny lovers), while the Legion Auxiliary will sell food and drink. “We hope to boost admissions at this year’s Hop-a-Thon, so that we can highlight our mission as well as why rabbits make great pets,” said ESRREC President and founder Cora Dickson. New features are being added to the Hop-A-Thon this year. A bunny costume contest will be held at 4pm, which is open to any pet bunny regardless of whether they participate in the class and competition. Three winners will each receive a $10 gift card from Concord Pet Foods & Supplies. In addition, people whose bunnies have gone over the Rainbow Bridge can memorialize their loved one at the Angel Table. For a suggested donation of one dollar, they can represent their pet rabbit at the table with a battery-powered LED tea light. A bulletin board will be provided to post photos. ESRREC’s overarching goal is to raise awareness that abandoned bunnies – like other pets – need homes. As part of its mission, ESRREC focuses on educating potential adopters regarding proper care and attention. Without such preparation, new pet rabbit owners often fail to understand the commitment, leading to abandoned rabbits particularly in the months following Easter. Since it opened its shelter in April 2015 on Main Street in Rock Hall, ESRREC has taken in 181 rabbits and conducted over 120 adoptions. All ESRREC adoptable rabbits are litter box trained and fed a healthy diet including mainly fresh hay from local farms. Through collecting donations and other fundraising, ESRREC has also been able to arrange spay or neuter for more than 145 of the intake rabbits to get them ready for new homes. The rabbits are transferred from regional shelters, are surrendered directly by owners, or are brought to ESRREC after being found as strays. Families who foster rabbits have enabled ESRREC to grow beyond its shelter capacity. The official site for the Hop-a-Thon is http://esrrec.org/hop-a-thon. Learn more about ESRREC at http://esrrec.org.